February's parade of adequacy marches on this weekend with two new films you'll vaguely recall at the end of this year. Although to be totally fair, one of these films does have a bit of historical significance, and it's not the one with the B-level comedy pairing. 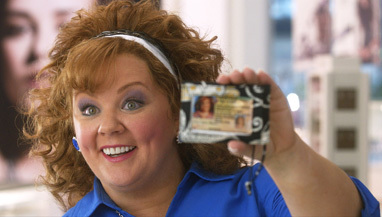 Identity Thief brings together (at last!) Jason Bateman and Melissa McCarthy for an anti-buddy comedy. McCarthy plays a small time hustler who has taken Bateman's credit cards and ID and is on a cross-country spending spree, which leads Bateman to track her down and confront her, in the supposed hope that she'd see the error of her ways and stop destroying his business. She... does not quite agree, and this leads to a cross-country attempt to bring her to justice, like a demented cross between Midnight Run and Planes, Trains & Automobiles, just not nearly as good as either of those films. While Bateman slamming McCarthy's head into a window for singing annoyingly is a good gag, I'm not sure it makes for a feature film. The film has a moderately decent pedigree, with director Seth Gordon having brought us the better-than-it-had-a-right-to-be Horrible Bosses, which this vaguely resembles, possibly just because of Bateman. Less encouragingly, the writing team is behind a few of the Scary Movie films, plus the second Hangover, so there goes that idea. Reviews are also unkind to the film but the better (and frequent) commercials probably counteract this. Bateman is sort of a wild-card in terms of drawing power at the moment. While Horrible Bosses and Couples Retreat are solidly in the win column for him, The Change-Up and The Switch (and I dare you to remember which of those films is which with no Googling) land in the “meh” column. Melissa McCarthy has yet to really be tested in a lead role, though her solid TV career in Mike & Molly can't hurt her exposure levels. Ultimately, I think the likeable cast and decent commercials win out slightly over the terrible reviews and thin plot, and we get an opening weekend of around $17 million.